William Boyd in "his seat" at Duxford in 2005. This was a 'special' raid in which Bomber Command was tasked to attempt a night time precision raid on the German research establishment at Peenemunde, on the Baltic coast. It was here that the V-2 rockets were built and tested. It was essential that a decisive blow be struck against this target, and crews were made well aware at briefing that they would have to return the following evening if sufficient damage was not incurred. Such was the importance of this raid, that most of the squadrons operating, were led by their Wing Commanders. A force of 596 bombers started leaving their home airfields on a pleasantly warm summer’s evening. Twelve Lancasters had been detailed from the squadron and at 21.35 the first aircraft and crew speed down Fiskerton's runway. Five miles beyond the runway’s end lay the city of Lincoln with its majestic Cathedral silhouetted against the setting sun. Most of 49 Squadron's aircraft bombed from about 7,000ft. By this time, the German controllers had realised the real target and had re-directed the night fighters. In conjunction with strong flak defences, the fighters took a heavy toll of bombers, especially the 3rd and final wave. For the first time the German fighters were using a new weapon, codenamed 'Schrage-Music'. It consisted of two 30mm cannon mounted to point upwards from the fuselage. So equipped the pilot slipped underneath an unsuspecting bomber and aimed shells up into the wing fuel tanks. Once perfected, an experienced crew could bring a bomber down using very few rounds. Forty aircraft fell, with 5 Group losing 17 - Fiskerton had 4 Lancasters shot down, one-third of those dispatched by 49 Squadron. Sgt Charles Robinson and crew were attacked and shot down after bombing. The fighter attacked from the rear... rear gunner F/Sgt Jack Wallner RCAF managed to shout a warning to the pilot before both he and the enemy opened fire. Five of the crew managed to make their desperate escape but unfortunately both gunners perished. Click here for a crew photo extracted from the Squadron photograph of April 1943. An “Aiming Point” award for the raid on Hamburg – ironically he was standing in for another Flight Engineer. He never received one with his regular crew! A painting Graham Boyd had commissioned showing one of his father’s aircraft .......“O – Oboe” above Lincoln Cathedral. William Boyd presenting a replica “blower” which could cook food using heat from a scrap of coal to the curator of the Stalag IVb museum in Muhlberg in June 2005. A close up image can be viewed in the PoW and Evaders Gallery. A page from William Boyd's logbook. In the 1980s William Boyd's son who was working in the US managed to locate Don Sheehy. 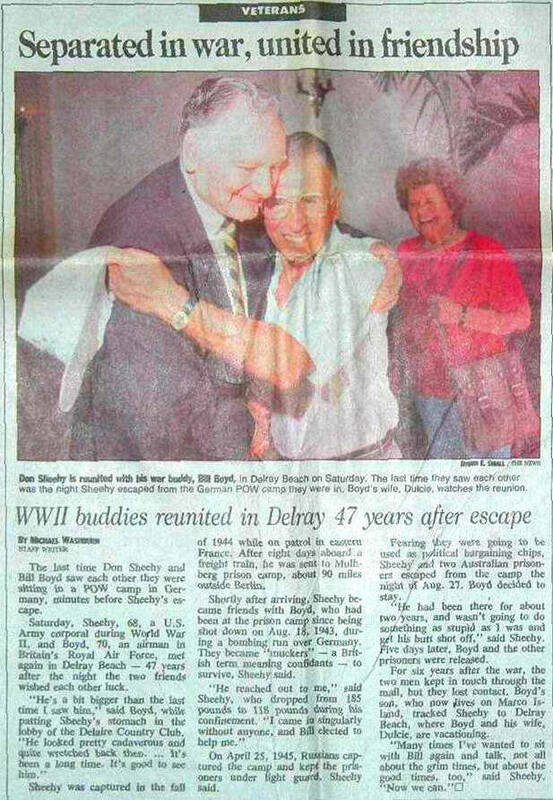 Click on the image to read the article which describes their reunion. The Caterpillar Club badge awarded to Sgt Boyd following his escape by parachute.